Miya Carmichael/Contributing Photographer The eighth annual Holi festival took place on the Newing College co-rec field on Sunday afternoon. More than 350 Binghamton University students were splattered with various colors for the eighth annual celebration of Holi, a Hindu holiday that welcomes spring, on the Newing College co-rec field on Sunday afternoon. Also known as the “Festival of Colors,” Holi attendees celebrated by throwing more than 300 pounds of colored powder into the air and 1,000 water balloons at each other. The annual event was organized by the Hindu Student Council and Delta Epsilon Psi, a South Asian service fraternity at BU, and charged $7 per ticket. Students were given white T-shirts to smear powder and water on, as well as samosas and mango lassis — food and drink that are traditionally associated with the festival. All proceeds went toward the Juvenile Diabetes Research Foundation. In Hindu legend, Holi is celebrated to commemorate the triumph of good over evil. According to Hindu legend, King Hiranyakashipu, a king of demons, believed himself to be the most powerful of all the gods and demanded they all worship him. His son Prahlada, a worshipper of Vishnu, was subject to harsh torture as a result of not worshipping his father, and Hiranyakashipu conspired with Prahlada’s aunt, Holika, to kill him by leading him into a bonfire. Prahlada was saved by Vishnu, and Hiranyakashipu and Holika were killed. 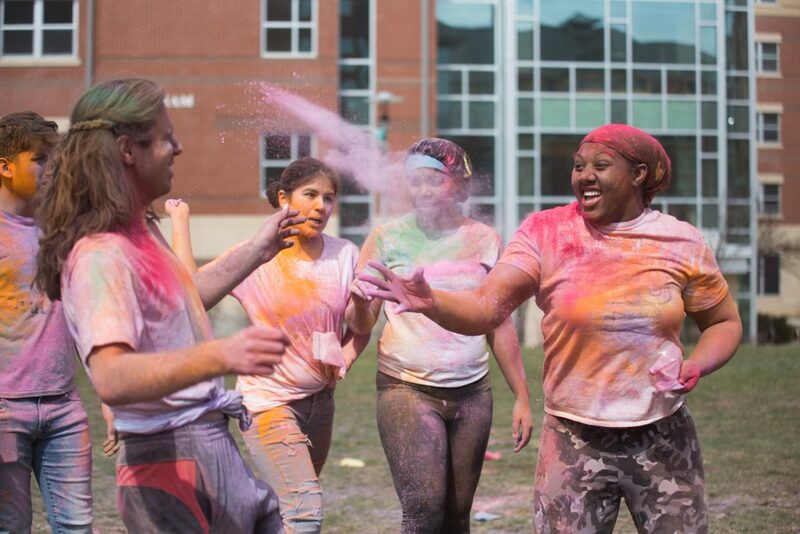 According to Shivani Tambi, president of the Hindu Student Council and a senior double-majoring in English and economics, Holi has been celebrated for thousands of years in India, and the on-campus event aims to mimic those same traditions. The tradition of throwing colored powder and paint comes from the legend of Hindu gods Krishna and Radha. Krishna, whose skin is tinted blue as a result of being poisoned as a child, was unsure if Radha, the goddess of love and beauty, would ever love him. His mother suggested he approach her and color her face with red paint to woo her. Radha fell in love with him, and thus the tradition of smearing paint and colored powder on loved ones and family was born. Pranjal Patel, a junior majoring in philosophy, politics and law, said although she was celebrating the holiday away from home, she was excited to share the tradition with friends. For Alisha Sharma, a freshman majoring in biology, the celebration at BU was lively and fun. Others were celebrating the holiday for the first time. Valerie Pascuzzi, a sophomore majoring in integrative neuroscience, was not raised in the Hindu faith or Indian culture but was excited to try something new.